That shot of those birds is amazing, it looks very cool. Have a great weekend! I am sending lots of healing purrs to Leo! That tote bag with Sammy is amazing! Why doesn't my human do an awesome tote like that with me? schöne Frühlingsfotos hast du eingefangen! Jetzt hört man morgens & abends wieder die Vögel zwitschern, herrlich ist das! Wie lang hast du gebraucht, um Leo zum Tierarzt zu bekommen??? Das ist bestimmt ganz schwierig & sie wissen ja nicht, dass man ihnen nur Gutes will! Poor Leo, hope he's recovering nicely. What happened to Leo?! Poor baby--my cats hate the vet, too. 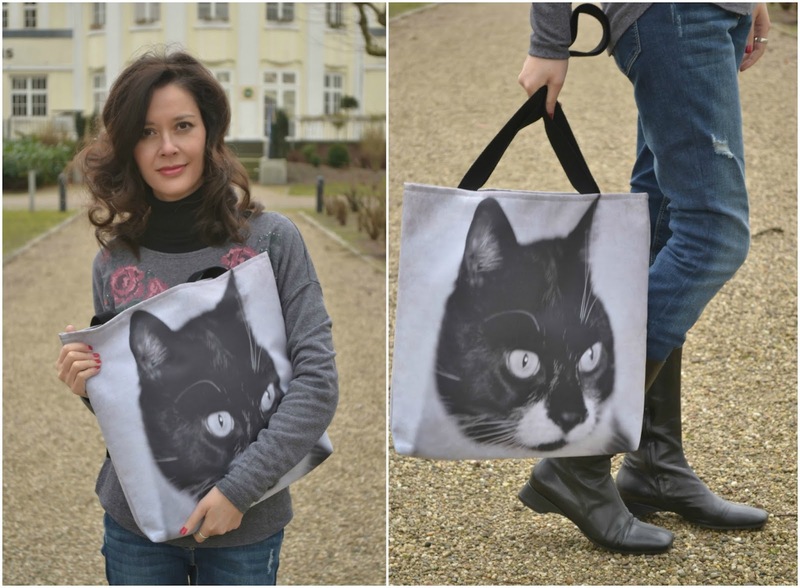 The cat tote is a great idea--I love how big it is! Lovely to see you with a bag... such a great photo and a beautiful model! Those flowers are making me jealous! It's finally going to be warm enough today for some of the snow to melt, so maybe I'll see some greenery myself. What a perfect week! Sammy is adorable on the tote bag. It must be fun to carry him around that way. The flowers are gorgeous. So looking forward to spring! I hope Leo's eye is back to normal quickly. Poor little guy! What an adorable cat :) You captured some beautiful color with the flowers. Have a nice weekend. The crocus are just so stunning! I can't wait til ours bloom. Love that tote bag! Really cool! Best wishes to your kitty. Hurry spring! ich liebe lilafarbene Krokusse! Sie leuchten so schön auf Deinem Bild. Ich kann mir sehr gut vorstellen, dass Du viiiieeel Geduld gebraucht hast, um Deinen Kater einzufangen. Eine Freundin von mir hat auch einen freilaufenden Kater und sie verzweifelt manchmal mit ihm :-) Aber als Fotomodell ist Dein Sammy wirklich süß. Unsere Woche war sehr schön. Ich war bei meiner Schwester in München. Natürlich habe ich Ausschau nach Cath Kidston gehalten, allerdings keinen Shop gefunden. Naja, irgendwann finde ich bestimmt einen. Vielen Dank für Deinen Tipp! love the photo log! Have a great week! Love your photos! Leo is so handsome! We're sending purrs that he is all well soon! Love the Sammy bag too! 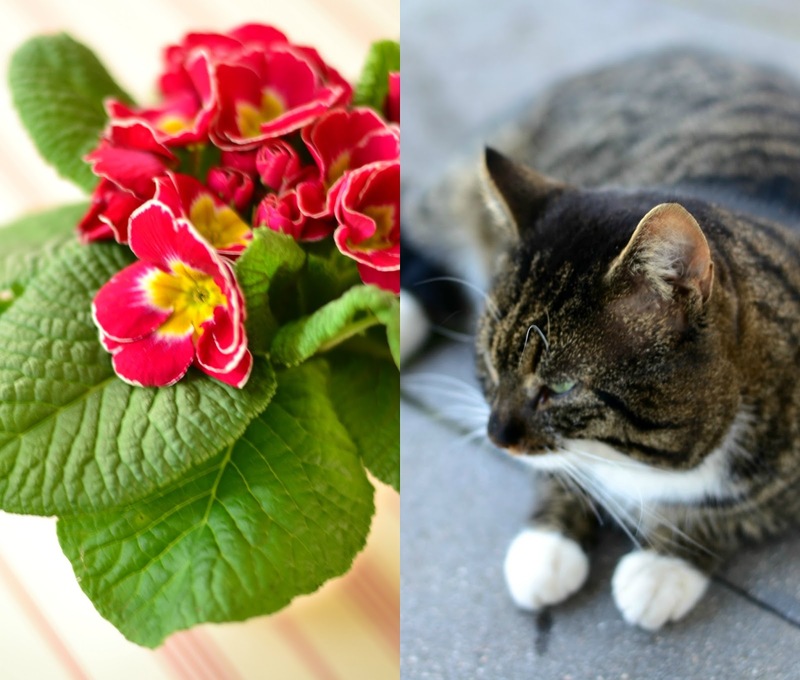 Flowers, kitties, and chocolate-y goodness is my kind of week! Great photos! I love your overall outfit. We live in a tropical country so there's no way we can wear boots here. Though I really love your pair! Your layered top is perfect and your rugged jeans are beautiful. I like it! Love those beautiful Spring flowers!! And the cat bag is the cutest. You enjoy those beautiful flowers, I can't wait for our snow to go away so we can have flowers again. I hope your cat is doing well after the experience of going to the vet. I love your tote bag with the picture of Sammy.